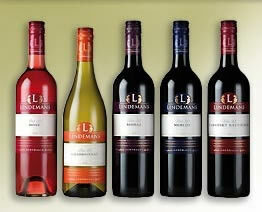 Lindemans Bin 80 Cabernet Merlot 2007 is a youthful but nice addition to this Australian winemaker’s lineup. We’ve been partial to their products in the past, notably Lindemans Cawarra Shiraz Cabernet 2004 and Lindemans Bin 50 Shiraz 2005. This red wine is 60% Cabernet Sauvignon and 40% Merlot. It has an earthy cherry and spice nose. It’s well-structured, with plum and cherry notes dominating its fruit forward flavor. Perhaps it’s the minimal age of this wine, but we found it needed plenty of breathing time to bring out the nice balance between fruit and tannins. As seems to be typical for Lindemans, their Bin 80 Cabernet Merlot 2007 is a true bargain – a very drinkable red at a great price. This entry was posted in Cabernet Sauvignon, Merlot, Red Wines, Wine Reviews on April 8, 2008 by Roger. for many years, i have steered away from wine as after two glasses – you have the most horrible, uncureable headache/hangover. this is the first wine-cabernet or merlot that my friend and i have drank till the wee hours with no next-day i will never drink wine again syndrome.